As I had a late lunch, I checked out of my hotel slightly later than 4pm and waited for the next shuttle bus from the Westin Nagoya Castle to the Nagoya Station where I will board my next Shinkansen train. 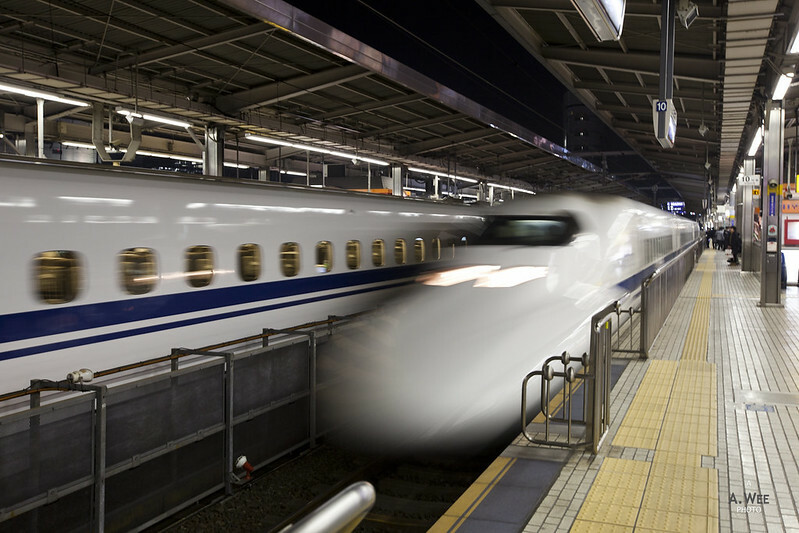 Travelling on the Shinkansen between cities in Japan is one of travel’s best inventions, and that is one reason why I find China’s push into high-speed rail will spur consumption through tourism growth in the country. My favourite parts of travelling in Europe was in Germany and Italy where their high-speed rail network connects their major cities (Hamburg to Berlin and Rome to Milan). Departing on an evening train from Nagoya, it took me less than a 1 hour and a half ride on the Shinkansen to reach Shin-Osaka station. Upon reaching Shin-Osaka, I boarded the Midosuji subway line to Namba station, and transferred to the Kintetsu Nara line to take the train to Uehonmachi station where the Sheraton Miyako Osaka is located at. Arriving at the basement, I made my way up to the second floor following the signage which was pretty easy to follow. The best way is to look for a store selling Belgian waffles and the escalator beside it will lead to the Sheraton Miyako entrance. However upon entering the hotel, there is another escalator to bring guests to the the lobby. 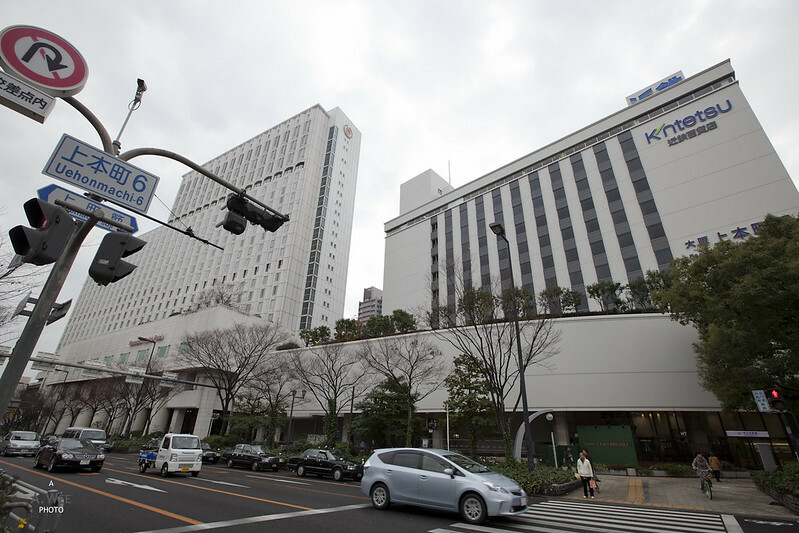 This hotel is also accessible for having airport buses to both Osaka Itami and Kansai Airport. Starting at this point of my trip, my sister will join me for the journey so it would be twin beds from now on. Check-in was fast unlike the one in Westin Nagoya, and similar to the Sheraton Miyako Tokyo, the receptionist let me know I was upgraded to a club room, and this property actually had a club lounge as well. Next I was informed of the breakfast at the second floor restaurant though I had to request for late check-out myself. The room here is very basic, not unlike the Sheratons one gets in the United States, and it felt even more spartan than the one in Tokyo. The twin beds were large enough and there was actually ample seating including a couch by the window. 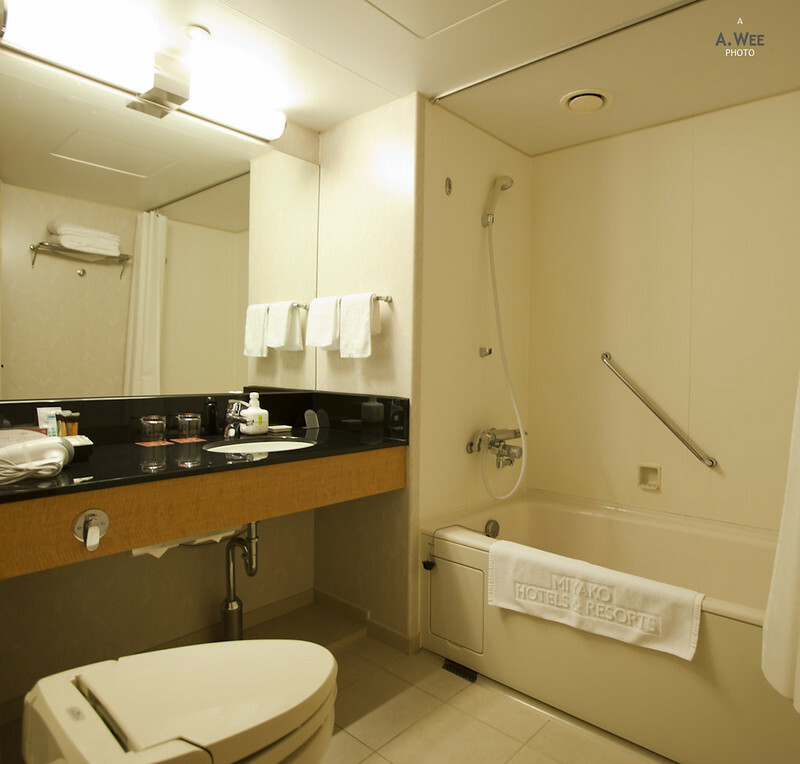 The bathroom was also smaller than the one in Tokyo and only a bathtub was inside though the toilet still has the additional fixtures for washing and cleaning. 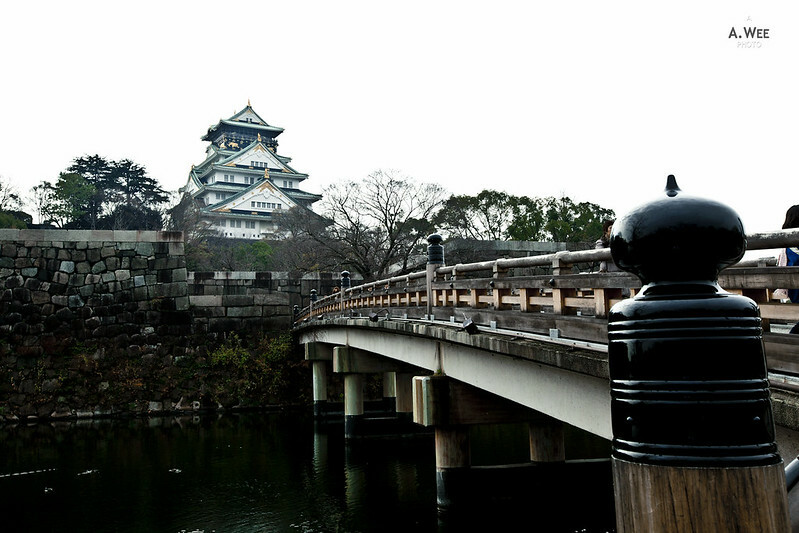 A good reason to stay here is for the day trip to Nara as the Kintetsu rail stops at the Nara city centre and just walking distance to the major sights in Nara. 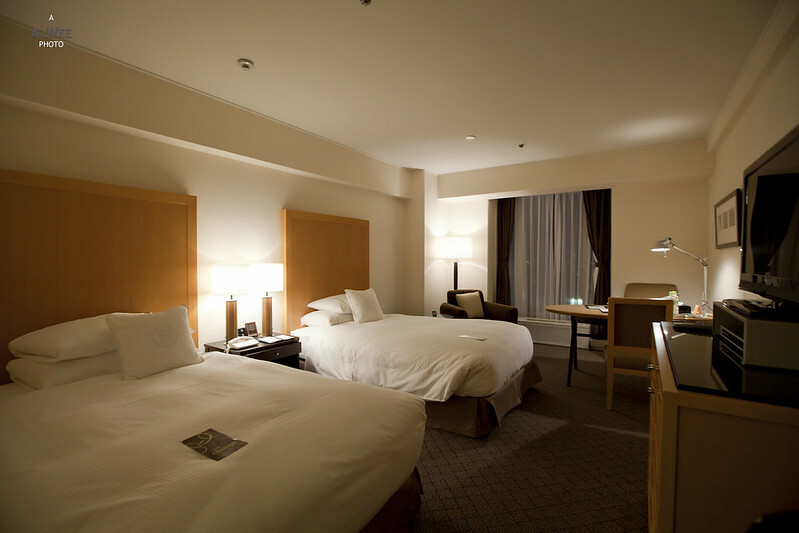 Another would be for the low rate offered in the hotel which could range around ¥8,000 per night for 2 person. This rate would make this one of the cheapest hotels I stayed in Japan. When checking in, the receptionist provided vouchers and the breakfast here was similar to the offering in Sheraton Miyako Tokyo with the basics like scrambled eggs, bacon, and ham in addition to congee, salad and fruits. It was alright but nothing memorable about it. The club lounge at the top was also pretty small and perhaps the size of two guestrooms converted into a seating lounge with some cookies and beverage counter along with a coffee machine. For the price though, I think the hotel is a good deal and definitely worth it for the money if looking for basic accomodation in Osaka. The next morning after breakfast, we walked around the neighbourhood and it seems that the area around the hotel is more like a residential area (again similar to the Sheraton Miyako Tokyo). I guess I should just stop comparing since they are after all owned by the same company. Location-wise, it is quiet and yet still very centrally located as well as having direct train link to Nara directly underneath the hotel. It was also a short walk to the Tsuruhashi 鶴橋 station from where I boarded the direct train towards Osakajokoen 大阪城公園. 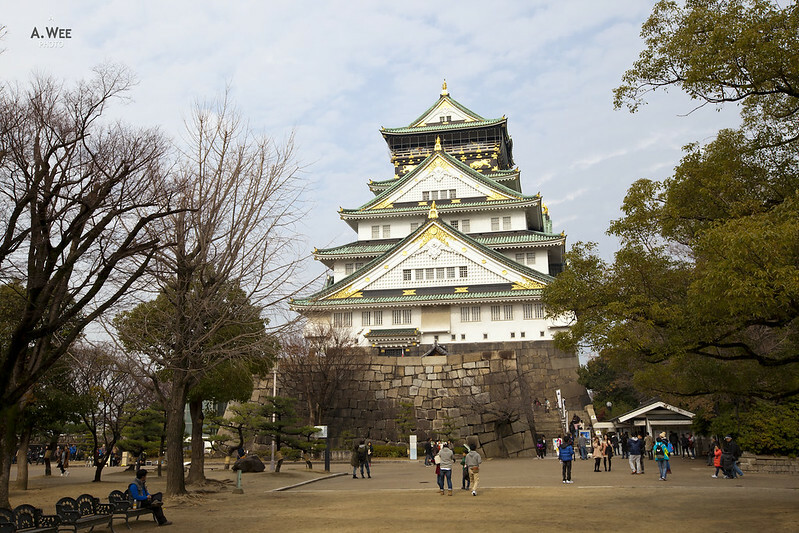 Osaka Castle is perhaps one of the most recognizable landmarks of the city and it has a very large park and several office buildings around it. There is also a stadium beside of some sorts which hosts events and concerts for those keen to experience Japanese pop music. Be prepared for a long and tiring walk around the castle though due to some steep incline around the castle, and in my opinion the best views of the castle are from the bottom around the moat, so there is no need to climb all the way to the centre unless one is keen to visit the castle itself. For lunch, we had it at Umeda 梅田 Station which is also directly linked to Osakajokoen, and as before I chose to eat at one of the restaurants on the top floor of the department stores in the area. We picked on a Kushi-Katsu outlet which serves various skewers that are deep-fried with breadcrumbs. With no English menu to order from, we picked from the set lunches. There were 2 plates for every diner in the restaurant and one plate consisted of the various dips and sauces. 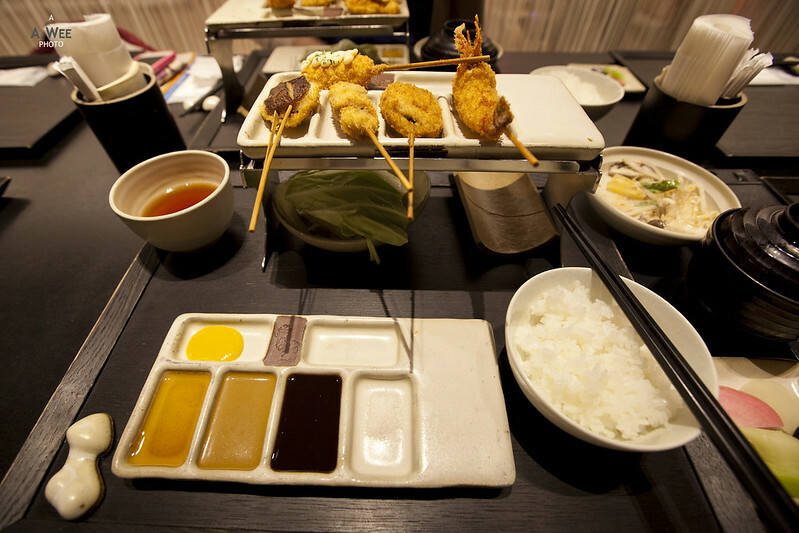 A similar compartmentalized plate holds the various kushi-katsu that is served in stages. The way to eat them was to dip the skewers in the corresponding sauce. Turns out to be nice and it is worth noting that Kushi-Katsu is a specialty of the Kansai area (Osaka and Kobe), and it is worth going to this restaurant just for the way these kushi-katsu was served since it was easy for diners to choose the right dips for the right skewers. In the evening I decided to move to the St Regis Osaka for the next 2 nights, after getting some good deals on a Starpicks rate and thus we checked out at 4pm and headed to the St Regis which is located in the stylish Midosuji area. Meanwhile at night, a friend who has been living in Osaka for the past few years brought us for some local Okonomiyaki, another specialty of Osaka. The local eatery which I discovered to be called Okaru is not commonly found by travellers as it is neatly tucked in a side alley. 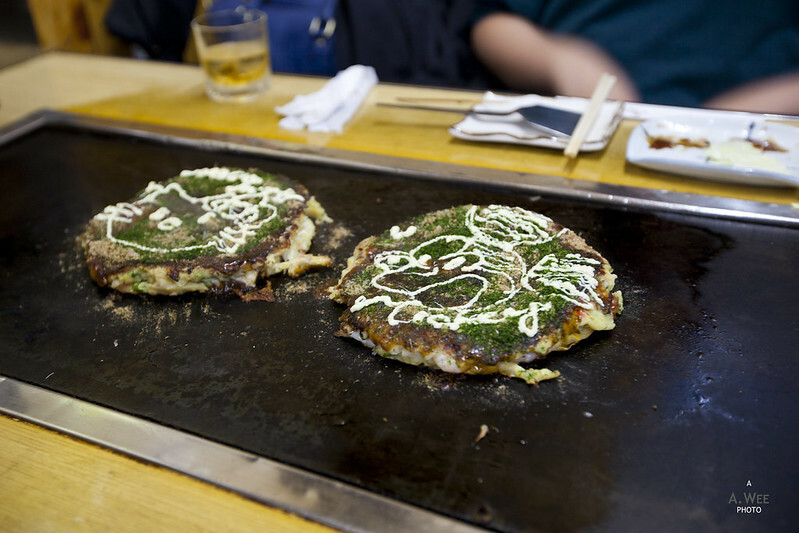 However the okonomiyaki was suprisingly nice and the service was wonderful as well! 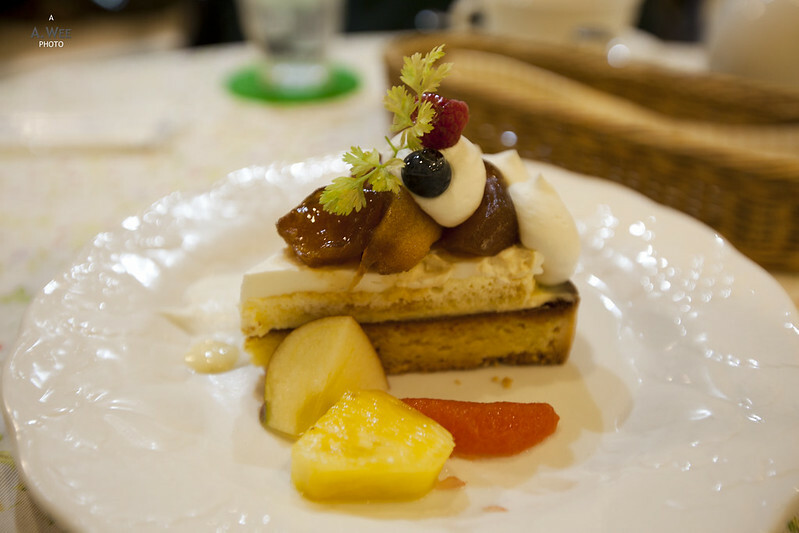 The highlight of the dinner was when the server added in a well drawn picture of Hello Kitty and Mickey Mouse using the mayonnaise on top of the cooked okonomiyaki! 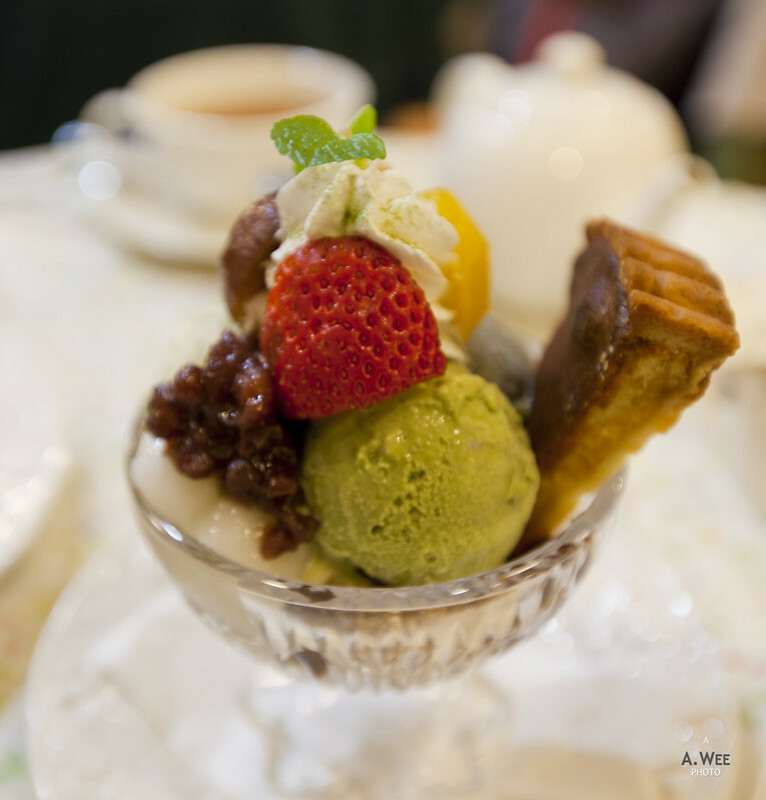 The downpour during the evening did not dampen our mood for dessert after the meal and we had an excellent green tea (matcha) parfait with chestnut cake. This counts for a wonderful day spent in Osaka!